In case you didn’t know, Republic Act 10913 or the Anti-Distracted Driving Act comes into effect starting today, May 18, 2017. And with that, there has been some misinformation spreading throughout the internet. Thankfully, the Department of Transportation (DoTr) has come up with an FAQ about this new law. We’re posting it here in verbatim for your information. 1. What is RA 10913 or the Anti-Distracted Driving Act? 2. What vehicles are covered by this Act? 3. What does this law prohibit? 4. What are the actions exempted from this law? 5. Can we use hands-free devices like microphones and earphones? Yes. 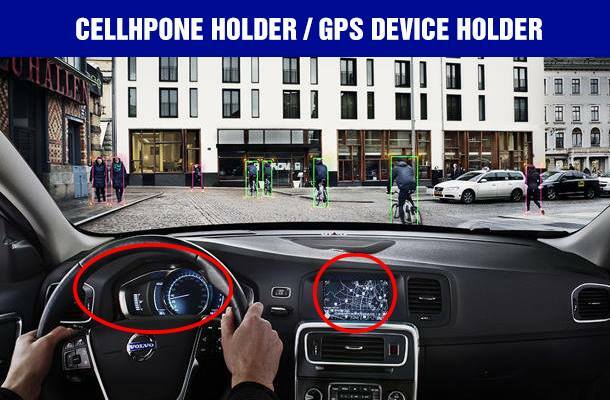 Motorists can use the aid of hands-free function and applications as long as these do not interfere with the driver’s line of sight. This means that no communication or electronic gadget should be affixed on the car’s dashboard and steering wheel. In addition, drivers are only allowed to wear earphones when making or receiving calls. Using earphones to listen to music falls under “similar acts” in Section 4B of the law, in addition to reckless driving violation penalized under other relevant laws. Dashcams may be placed above the dashboard or behind the rear view mirror as long as it does not obstruct the driver’s line of sight. 6. Can we still use traffic and navigational apps like Waze and Google Maps while driving? Yes. Although motorists are being advised to set their preferred destination on these applications prior to their departure. 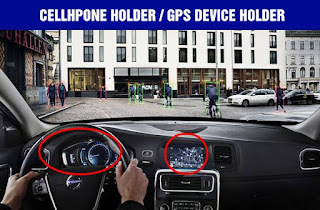 Gadgets with these applications may be installed in areas shown in the picture below, or other areas that will not obstruct the driver’s view. In cases when motorists need to find alternate routes while in traffic, they are advised to first pull their vehicles aside. 7. Who are authorized to apprehend violating motorists? The DOTr - Land Transportation Office (LTO) is the lead implementing agency of the Act. The LTO also has the authority to deputize members of the PNP, MMDA, and LGUs to carry out enforcement functions and duties. 8. How will we know if drivers of private vehicles with heavily-tinted windshields are violating the law? Aside from some high-definition cameras that can monitor lights from devices inside tinted vehicles, the law will also be enforced by enforcers on the ground who were trained by LTO to determine from the movement of the vehicle whether or not a driver commits distracted driving. A Memorandum Circular setting specifications on the regulation of tints shall be released by LTO soon, upon consultation with tint manufacturers. 9. What are the penalties? Violators will be penalized with a fine of Five Thousand Pesos (P 5,000) for the first offense, Ten Thousand Pesos (P 10,000) for the second offense, and Fifteen Thousand Pesos (P 15,000) for the third offense with a three-month suspension of driver’s license. Violations incurred beyond the third offense shall be penalized with the revocation of driver’s license and a fine of Twenty Thousand pesos ( 20,000). 10. Are operators of Public Utility Vehicles (PUV) also liable for violations made by drivers? 11. When will this be implemented? The Anti-Distracted Driving Act shall be implemented nationwide starting May 18.
paano mo naman mailalagay ang navigational devise mo sa may gauges at aircon vent. mas aalis nga ang tingin mo sa daan dahil nasa baba ang devise. hay buhay talaga. dito nga sa Dubai ay hindi bawal maglagay ng phone holder sa windshiled eh. It's 'distracted driving', but they're limiting it to gadgets. What about jeepney drivers counting money and handing out change while driving, aren't they distracted? Buying from takatak vendors' no distraction? People grooming themselves, putting on make-up while driving? People eating while driving? No distraction? I think the bottom line is that you're supposed to be focused on driving and doing nothing else. Mas "safe" daw and yumuko para tignan ang waze display kesa mata lang ang gamitin (peripheral vision) para tignan saglit ang display. Mga bobo talaga gumagawa ng batas hindi pinag-aaralan mabuti. are gauges allowed on the dashboard? I have one on the right side and 3 at the center.